JM: What brought you to founding Be Bear Aware? CBB: I believe that as a nature photographer, we have an obligation to be stewards of our wildlife. 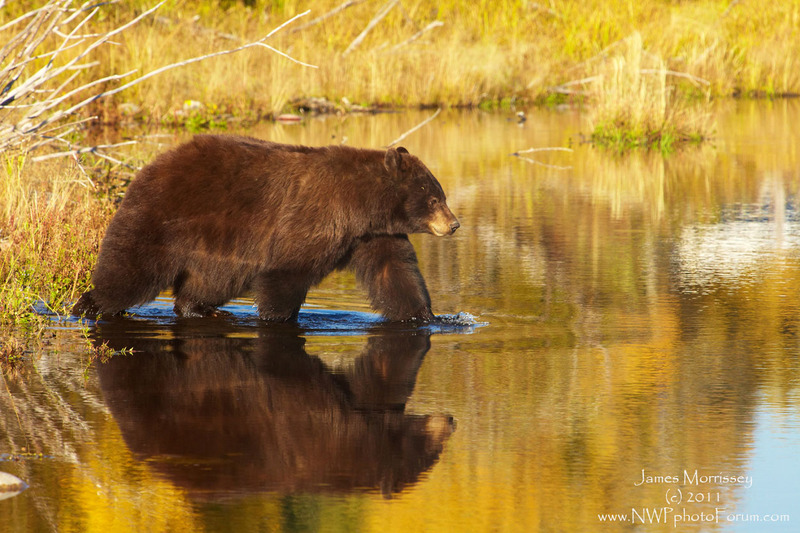 I have always been a nature photographer, but I really want to be an educational nature photographer, assisting the State, Federal Wildlife land management agencies with getting their message out on bear safety and wildlife stewardship. That is an area that gets talked about a lot in a vague sort of way, but somehow doesn�t get going. CBL What I mean by that is that there are approximately 350,000,000 people in the US and I bet a good 150,000,000 of those visit our national parks, forests and refuges. The problem is that they get only a little information before arriving on how to be a wildlife steward or advocate. They don�t know how to be stewards�and sometimes photographers are the worst examples of what a steward is supposed to be. For example, we have a big problem going on in the North West where they are trying to get photographers to stop urinating on rocks to get mountain goats to pose there so that they can get their pictures. The mountain goats lick their urine. The mountain goats get very aggressive in some areas and one person was killed by a mountain goat as he was hiking down the trail. Now you have areas where mountain goats are gathering as a result of this technique (which I do not consider a technique), and it causes some problems. Some photographers think we are trying to limit their ability to photograph and taking away some of their tools � but we are not. I believe that photographers have a responsibility for stewardship. Ultimately, the website is an effort to inform and educate the public about their responsibilities when they visit wild places. JM: So your website is not just about human safety, but animal safety too. CB Exactly! That is what we are trying to get to. 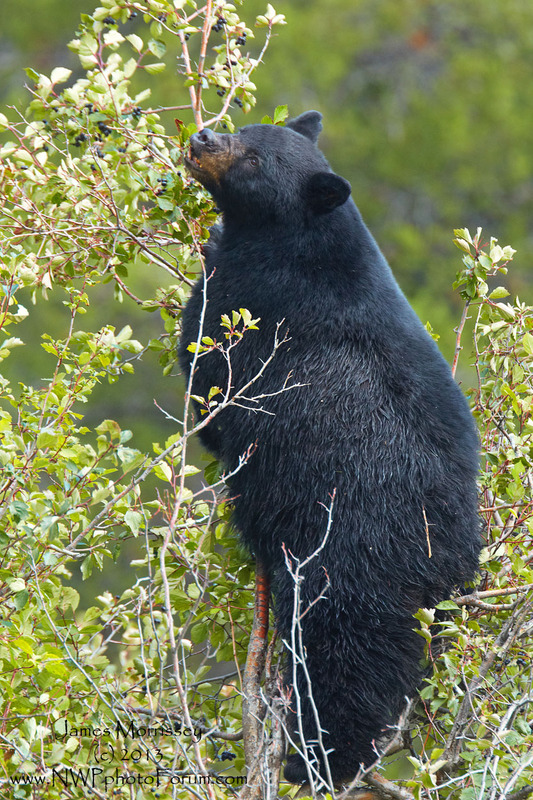 If a bear mauls someone, it may be a death sentence for the bear, and that mauling may have occurred for a reason. For example, it may have been trying to protect its cubs. Or it may have been stressed because someone was trying to take a �selfie� with the bear. It becomes a continuous problem of managing people. The agencies try to reach the people when they arrive � but it is too late, and there are too many people to track and they are moving too fast. We brought some college students in to do a survey visitors. Unfortunately, the material handed out the gate is often not looked at until they are ready to leave the park, it at all. They are so busy wanting to see the great sites of the park. Who wants to read a bunch of Dos and Don�ts?? The website is one way of trying to get this information to people before they arrive. JM: Let�s talk a bit about when a photographer encounters a bear in the woods. The way I see it, we have two types of encounters � the Intended Encounter and the Unintendend Encounter. I have had both types. I was particularly anxious after I had an unintended encounter last year in the Yosemite High Camps. CB Tell me how did you handle it? JM: I am supposed to be interviewing you! Having said that, I am fortunate that I was forced to watch some bear safety videos by my friend and mentor, Steve Kossack, before our Glacier workshop some years ago. CB: That is great. He did that?? Most people don�t do that. That is wonderful. That is a one-up. So what was your experience? JM: I was hiking in the backcountry of Yosemite, from Merced River to Sunrise Camp. I had stopped to photograph a scene (see below), and started whipping up the switchbacks to catch Steve. I came out near a bear � easily closer than 20 feet as I turned the corner. The bear, startled, started moving towards me. I picked up my arms and spoke in a loud, firm voice to the bear. The moment I did that, the bear stopped. I did it again and spoke in a loud voice at the bear telling him to go away. He went down the path where he stopped and looked at me again. Last, I did it again and he fled. I am fairly confident that had I not seen those bear safety videos that the encounter could have gone differently. I have seen bear in many situations. Heavens knows, I have been nearly as close in sections of Moose Wilson Road in the Tetons. The bears are very habituated to humans and the rangers are doing the best they can just to keep the bears safe. In the back country, you are on something that is solely their territory. It was a scary experience. JM What do you want photographers to know? CB Let�s set the stage. Most photographers are pretty darn responsible. They have telephoto lenses and tripods � though that is slowly disappearing with some of the fancier cameras these days. They have the ability to photograph from a responsible distance without interfering with the animals daily activities. However, tourists are attempting to get those photographs that they see in magazines that the pros are using with their 300-600 mm lenses. They are in cases walking in front of the professional and semi-professional photographers and becoming a nuisance in trying to get a good photograph. People are getting too close trying get good photographs with their hand held phones. That creates a huge problem � not just for the animal but also for the responsible people who wind up having the animal scared away. What you see is a Sow and Baby Grizzly. What you do not see are the people taking photographs of these bears with their cell phones. Photo contributed by Richard Strange. Wildlife plus distance equals safety for people and animals. The only problem is that even within agencies that distance varies all over the country. In Yellowstone, the allowed distance to a carnivore is 100 yards. In Great Smoky � and I am not sure if it is still this way � the last I checked it was 60. That is a huge difference. In Glacier it is 90 yards. The lack of consistency causes confusion. A hundred yards is a long way�though not that far for an animal that can move 35 mph in a sprint. JM: Is there bad information you feel people are bringing with them to the parks? CB: Yes. Part of the problem is that many tourists who come out have been watching the media. I feel the media helps contribute about 100 million dollars of misleading misinformation on how to enjoy the wildlife. Terms like �Get close� or �be stealthy� encourages people to sneak up on a grizzly bear. This is not a good idea. For example, Animal Planet, lost one of their heavy hitters, Steve Erwin, who was killed while � and please listen to this carefully - he was harassing a docile stingray that would not have stuck him in the heart with its stinger had he not been trying to block it into a certain photographic setting. JM I did not know that! I knew he died in that fashion, but I did not understand exactly how it happened. I had heard it was a fluke. CB He was trying to swim above it while a videographer was blocking it. I also understand that there were also people on both sides trying to keep it from turning. That is how a shark attacks � from above or below and it just stuck him. It was his natural impulse. It did not attack him, it defended itself from him. CB: Another example was Timothy Treadwell, who I knew very well and had met on numerous occasions. The Katmai National Park had me working with him trying to change his approach to dealing with bears. He was kissing them on the lips! It was just bazaar. And the ending of the video where he should have been saying �Amy Save Yourself� instead he was screaming for help. He told her to come out and hit it with something. And she came out of the tent and hit it with something and you heard her screaming for two minutes nonstop and then the recording ends. And so, there was no effort to save Amy. She was sacrificed. He had told me on one occasion that he was scared and did not want to do some of the stuff he had done in the past anymore, but Disney had offered him a job to be Brother Bear in a movie they were releasing. He said he was going to go around the country promoting it. Here is a guy with a short focal length compared to what the pros use, getting way too close, getting what I consider to be really great shots that you can get with a telephoto lens. Many other guys get great shots without stressing the bears. He ultimately got killed and it resulted in two bears being killed. JM: The most important issue seems to be distance. The other thing you talk about in reference to the mountain goat is baiting. Does that happen with grizzlies? CB: Absolutely. Wolves and grizzlies have had to be destroyed because photographers have baited them in the past and it created food conditioning. The two fatalities one was in Alberta (I think) and the other in Alaska were with food conditioned wolves. JM: The less nefarious thing � besides bating � then would be storage of food, yes? CB: That includes hikers, bikers, fisherman. If you stop along the river, make sure you put the food up like you would if you were at your campground. Lesson � Food should always be kept at least ten feet off the ground and at least four feet from side and top supports. Also have a food storage tube�and hang those too! Bears have been known to take off with them. Think about what I just told you. It took a long time for us to figure this all out. The trout fisherman put their waiters on and walk some distance to where they are going to fish. They are carrying a fly rod, a hat with hooks in it and a vest. The Grizzly Bears have learned to recognize this. They say �oh, fisherman.� They sit in the grass, out of sight, and wait for the fisherman to go out into the stream. They will just take their backpacks! Fisherman should always hang their day packs. Bears have become so aware, that if a fishermen puts their beverage in a net and drop it into the river, the bear will retrieve it. Sometimes you will see them with a big net with some beer in it and they will drop it into the water, unaware that there is even a bear there. While the guy is busy downstream fishing, the bear will grab the cans and take them on shore and starts biting into them. Bears have gotten real smart. And there is another side story to that. They are working really hard to avoid a confrontation with the humans. They let the fisherman do his thing and then they get his lunch and cans. The bear is generally working REALLY HARD TO AVOID CONFRONTATIONS. JM: Let�s talk about that. I am hiking down a trail with my backpack on, not really photographing, and I run into a bear. What do I do? CB: This is something you are going to have to work through. I am calling out �Ho Bear, Hey bear.� You need to call out and make your presence known. Some places tell you to make noise, but it just sounds like some sort of wounded animal. Be real specific�Hey Bear, Ho Bear. Something that is clear and easy for a bear to hear. JM: What about bear bells? CB: They absolutely do not work. They never have, and no one ever thought they would. JM: So you are saying the best thing to do is to make human sounds, and avoid high pitched sounds that may sound like a distressed animal. CB: Yes. And use your mouth, your noise, your ears, eyes � look for bear signs. I have had numerous signs when I have seen stuff that is clear there are bears in the area. For example an annihilated stump at the end of a trail and there is bear poo in the area. People will walk by and I will say �I am alone, did you see a bear on the trail� and they will say, �No. 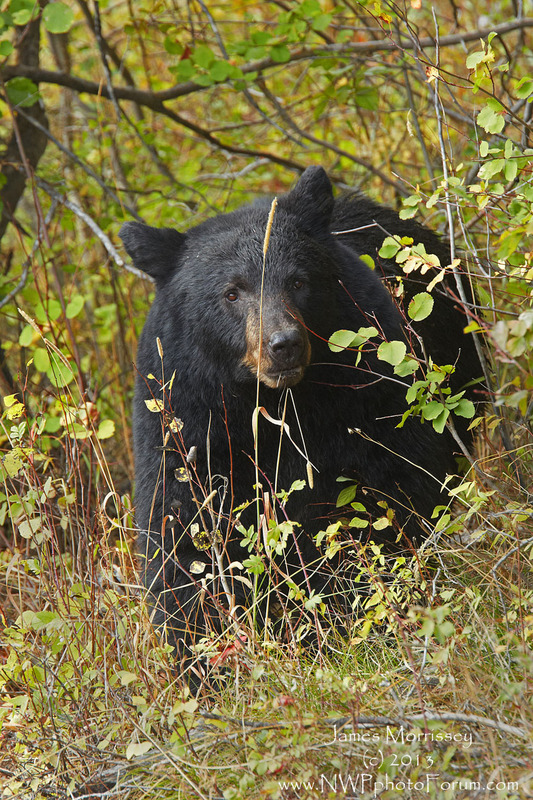 I have been hiking these trails for years and have never seen a bear.� And I will ask, �have you seen any bear signs?� and they will say �no.� YET WE ARE STANDING ON ONE. Get to know what a bear sign is!! If you see these signs, you need to take a good smell. If you smell something really pungent, be careful as there is possibly something dead nearby, and a bear may be sitting there who has claimed it. You certainly do not want to give a bear the impression that you are interested in his dinner. So you start walking, and if you run into it, it may stand up. As I was saying earlier, it is not an aggressive posture- though it could become one if you are too close. Usually though it is off to the side of the trail. So you don�t need to shoot it with either a gun or with bear spray, but you do stop and let the bear assess the situation. And you need to assess the situation as well. JM: So you are saying if the bear stops, you stop. CB Yes. That is correct. Some advice says if you see a bear, waive your arms. This is not the best advice. If if you waive your arms, or clap your hands real loud, or make noise, you may actually just confuse the bear. The bear wants to figure out that you are passive and non-threatening. The best way to appear non-threatening - in most cases - is to group together, make moderate sound such as "hey bear" and do not waive your arms. Unless you walk by the cubs, you are probably not in trouble. You also need to use that time to take your bear spray out and to pull your safety off. Slowly back away until you have a safe distance. Don�t try to hide from the bear or go behind a bush. Stay in the open but move a responsible distance away. CB: Did you get any shots of the bear you saw in Yosemite? JM: No. I felt at the time that I had startled it and I felt the most responsible thing to do was to put some distance between me and it. CB: You did the right thing. You do not want to stress the bear out. Sometimes people misread the bear and they do not realize that the bear is stressed and it will charge them. As I have said before, keeping a responsible distance is very important. JM The video I saw said to raise your hands and make yourself look big yet you seemed to downplay that earlier. CB: I have read that. I don�t tell people to do that or not do that. 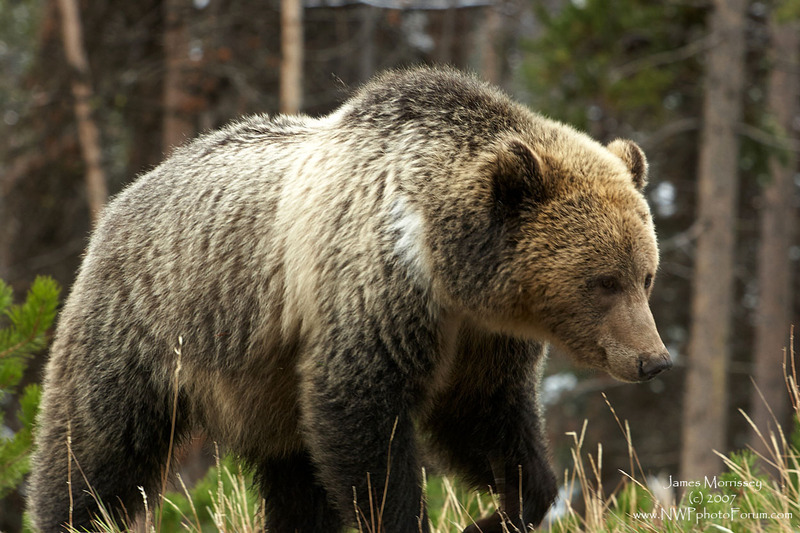 You have to remember that a Grizzly Bear is a 400 pound animal that can take down a bison, or a moose or an elk. I sometimes think that they must look at us and just wonder what the heck we are doing, he says, laughing. There is no indication that makes any difference at all. If you're raising your hands over your head, you won't be able to take your bear spray out of it's holster or prepare for a potential charge. A reason why you might raise yourself up like that is to give the bear a clear indication that you are there. For example, perhaps it does not realize you are there yet. Their eye sight is about like ours. When you move your hands up, it gives it something to focus on. I do not hide from bears. I have seen all sorts of things with bears. They get aggressive when they don�t know what is going on. JM: They are just like us then. They want to control their space. CB You come around a bend and you have not been making sufficient noise. You see a bear, frothing at the mouth, swatting at the ground, gnashing at his teeth and woofing out at you with his ears down is this good news or bad news? It is good news. You have a conversation going on and the bear is trying to say that you are scary and to leave it alone. 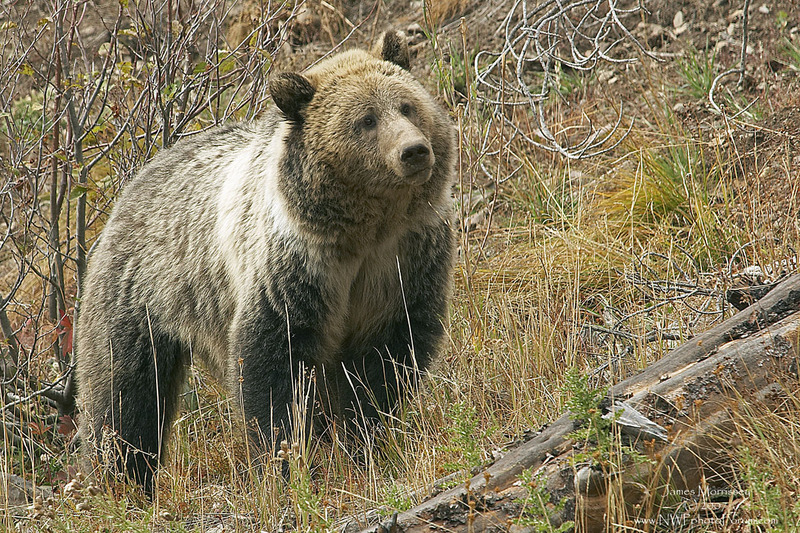 One thing a bear may also do - particularly grizzlies � is to charge you. I have had them run at me and kick dirt on me and run away. This is an expression of the bear's aggression and fear. JM You mean a bluff charge? CB I do not believe there is anything as a bluff charge. The bear gathering information and giving you information. It is telling you it does not want you there. It is upset. There is no bluffing going on. The media has also exacerbated this and show bears doing these �bluff� charges. This could be a serious situation. You also see all these commercials where these bears will eat a person�s hamburger and they are best buddies in the world. Not a good message. JM: So you believe in having bear spray at all times? CB: Absolutely! I carry two cans of bear spray, and if I see fresh bear activity signs, I remove a can from it's holster and carry it. If I see a bear, I immediately take the safety off and asses the situation from there. CV I have a nice story. Some people were out photographing an elk on the Iceberg Lake Trail. There were two groups standing on both sides of the deer, and all of a sudden, it ran off. Someone then shouted, "There's a bear!" Now there was a Grizzly Bear standing where the deer had been just seconds before. Everybody remained calm, lots of "ooh's and ah's." 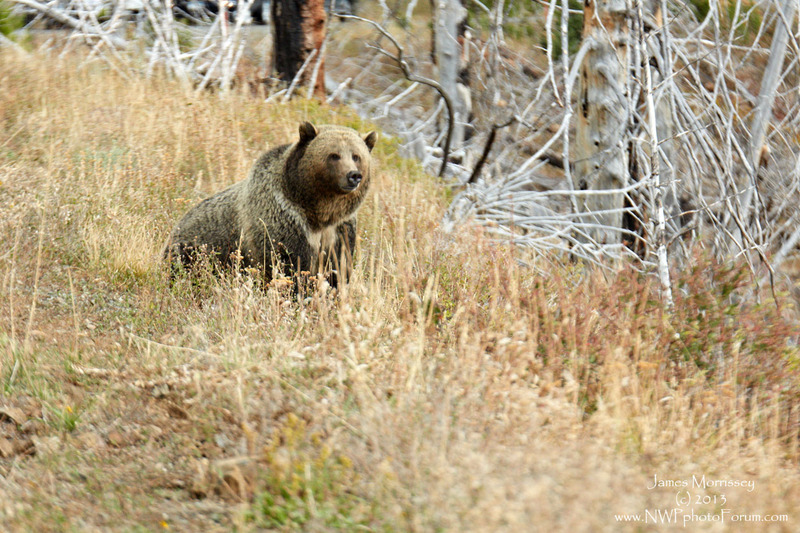 The Grizzly Bear slowly turned and looked at the group I was standing by, starring us down. It then turned it's attention to the other group, and starred them down too. Everyone remained still and non-threatening. 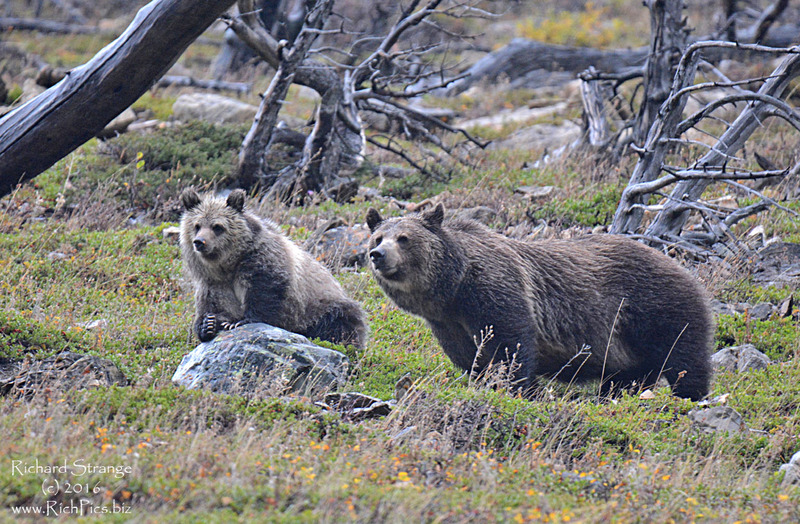 The Grizzly then looked behind itself and out of the bushes, two cubs emerged and scurried across the trail. She then returned her attention to the second group, and then again to the first group, as if thanking us for keeping our distance, and allowing her cubs to cross the trial unprovoked. Finally the Grizzly Bear disappeared into the bushes as well. It was one of those magical moments - beautiful - and nature at it's finest. You see, that was the right way. It all brings me back to the problem with what happened with Tim (Treadwell) in Katmai. He injected himself and deliberately got close. 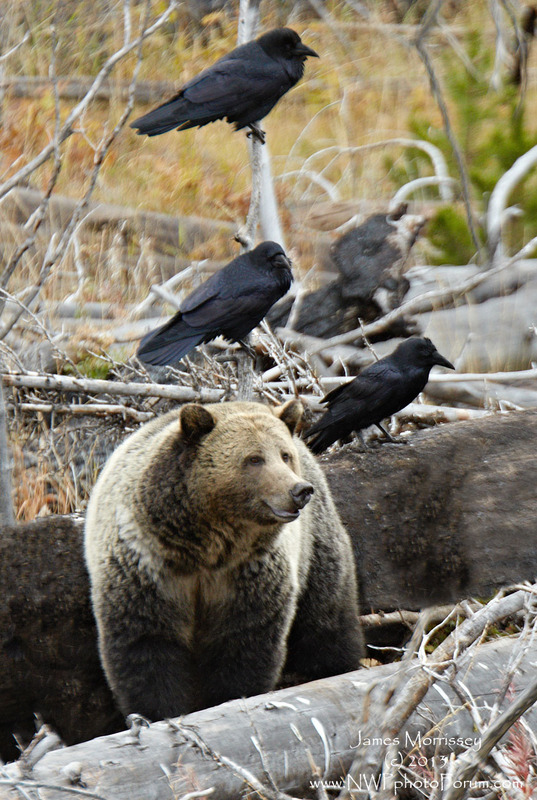 Because they were well fed, and away from other predatory bears, they were willing to tolerate him. The image that Tim portrayed was that it was his personality that allowed him this access to the bears�and it was the wrong message. His personality had nothing to do with it. The bears tolerated him for 13 years so that they could feed in that particular area, and the Parks Services allowed it to happen. The last couple of years, we were frantically trying to get him to change what he was doing, and then Disney came in and upped the pressure on him. Many of the employees honestly did not know the danger he was causing either. They thought he was protecting the bears from poachers. Yet he never showed any video or photographic coverage of the poachers. He even said that they had machine guns. Come on! We are talking about Alaska. You can legally kill a brown bear and not worry about being fined, much less showing up at Katmai with Machine Guns. The whole thing was misleading and intentioned to sell something on TV Shows. It was not just some of the TV Shows. Some of the Sierra Clubs was funding him too. I had to call some of his big funders and tell them that Tim and Amy had died. JM: Let�s us bring this to a close. If I had to boil it down into one paragraph, what would you want me to write? CB: (1) Make sure you have bear spray! (2) Keep a safe distance. (3) Learn to know your surroundings. (4) Call out Ho Bear, Hey Bear. (5) Smell for things that might be a dead animal. (6) Use your body �use your eyes to look ahead, beside and behind you. Bears are a little like rattle snakes. They don�t rattle until you are a little too close. (6) Also, find some time. Go talk to people about being bear aware. Educate the tourist and explain why we use telephoto lenses. (7) Also, when you are driving, keep to the posted limit so that no bears have to be hit by cars. If you have something extra between the electric, the heat and the rent, maybe you want to send a contribution. This is just a friendly reminder that this interview with Mr. Bartlebaugh is (c) 2016, James Morrissey and the Nature, Wildlife and Pet Photography Forum. It cannot be used, in whole or in part, without this writer's explicit written permission. Also, as a cautionary legal reminder as James Morrissey and the NWP Photo Forum does not get sued, please remember that bears are wild animals and must always be approached with extreme caution. The advice that Mr. Bartlebaugh gives must be viewed secondary to any rules that are provided by the specific park/community you are in. My thanks to my friend, Richard Strange, for sharing his photo of two bears being harassed by some people who were attempting to photograph with their cell phones. Please pass the link around. The traffic sure means a lot to us. If you like his site, please drop him a line. The people who donate their time on the website love the comments.